Harwood started with his home town Amateur team Bishop Auckland, before joining another famous Amateur team in Crook Town in 1900-01 before returning to Bishop Auckland in 1901. He was one of the stars of the Amateur game and won an F.A. Amateur Cup medal with Crook Town in 1901 when they beat Kings Lyn 3-0. He was also in the Bishop Auckland side the following year, only to be beaten 1-0 in the Final at Elland Road. He also represented the Northern League before turning professional with Southern League club Fulham in 1903. He had three years there before, after scoring only two goals in twenty-eight games, he signed for Leeds City in May 1906. 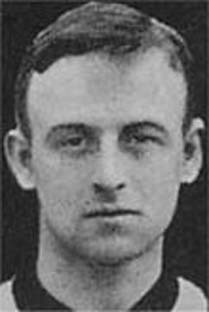 He only played one game for City scoring on debut in a 2-1 win at Burnley on 2nd March 1907, as first David “Soldier” Wilson and then Billy McLeod were the preferred Centre Forward. He was a regular in the City Reserves, scoring forty goals for the season and he scored both goals in the 1907 West Riding Challenge Cup Final when City beat Kippax Parish Church 2-0. He left for Southern League West Ham United in 1907. Harwood made his debut against Reading on 23rd November 1907 at Left Back, but failed to get a regular place in the side. In the 1908-09 season Harwood played nine games at left-back. Harwood left West Ham in August 1909, after not scoring once in twelve appearances as all his games were as a Full Back, and spent the next five years playing Amateur football in his native North-East with Spennymoor United and his home town team, Bishop Auckland. Harwood’s football career came to an end with the outbreak of the First World War.